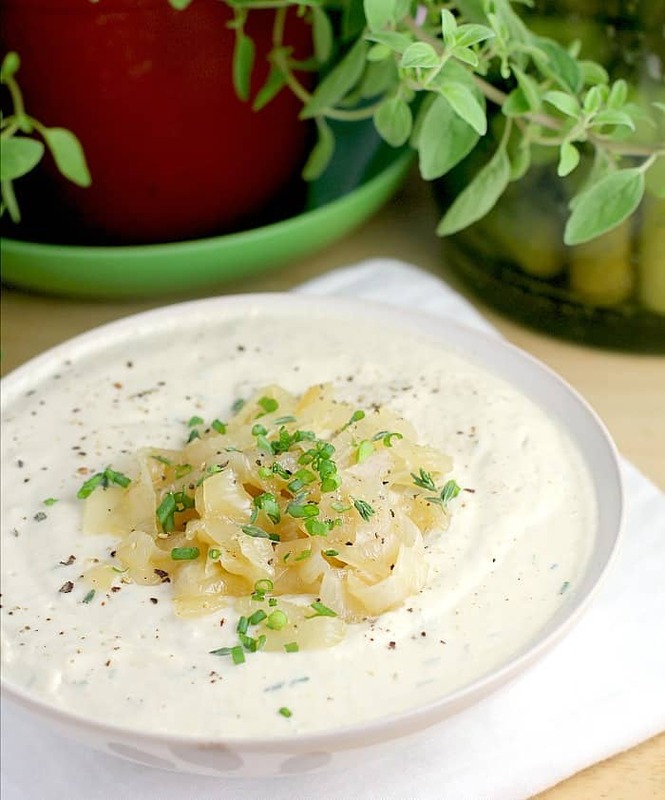 This creamy Vegan Caramelized Onion Dip recipe with delicate flavors of caramelized onion and wine make this a sophisticated dish perfect for your holiday entertaining. With Christmas and New Year’s around the corner, I wanted to get this gem of a recipe out the door because it checks so many good boxes. 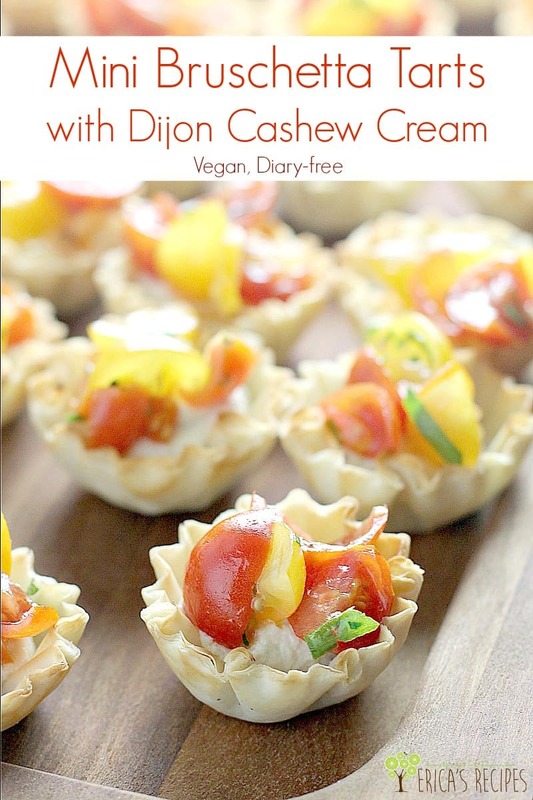 Dairy-free, vegan, healthful, and DELICIOUS, this recipe is especially perfect for New Year’s Eve because it is kinda posh. A little aloof. There is wine after all. 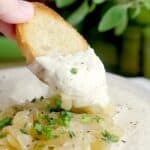 This here dippity dip is super easy, RIDICULOUSLY easy to make …except the part where you have to caramelize the onions. Not that that is difficult. It isn’t. But it takes some time and patience for that magic to happen. So, the first thing here is that we lovingly and tenderly and slowwwwly caramelize our onions to creamy, delicious awesomeness. Then we deglaze the pan with wine to make them even awesomer. Then we just blend up with the rest of the ingredients! See?? Simple. Now why even a vegan dip… Whelp, last year I went 8 months vegan. At first, it was out of my concern for the environment, and probably even a political statement to be honest. Heat the olive oil in a saute pan over medium heat. Add the onions and sugar, and cook on medium until they start to talk to you. Lower the heat to low and cook slowly, stirring occasionally, for about 45 minutes or until the onions are very soft and caramelized. Turn up the heat on the onions to medium-high. When they start to sizzle a bit, add the wine, and cook ~3 minutes, stirring, to deglaze the pan and boil off most of the liquid. Remove from the heat and set aside. Season with a pinch of kosher salt. Process the soaked cashews in a food processor until smooth. Add half of the caramelized onions to the food processor. Add the remaining ingredients and process until smooth. Transfer to serving dish. Roughly chop the reserved caramelized onion and top the dip. Garnish with fresh green herb. Serve with toasted crostini or cracker of choice. Yields: 12 servings. 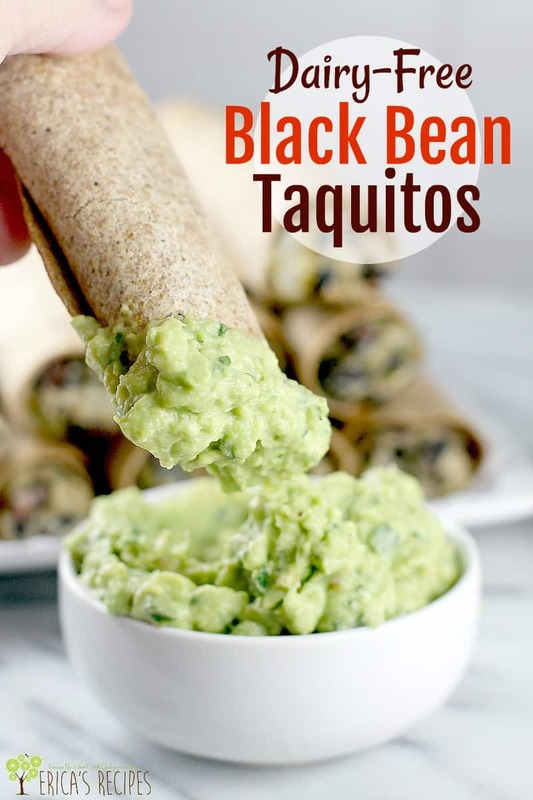 To keep this recipe vegan, go with a vegan mayonnaise such as Just Mayo, which is what I used. 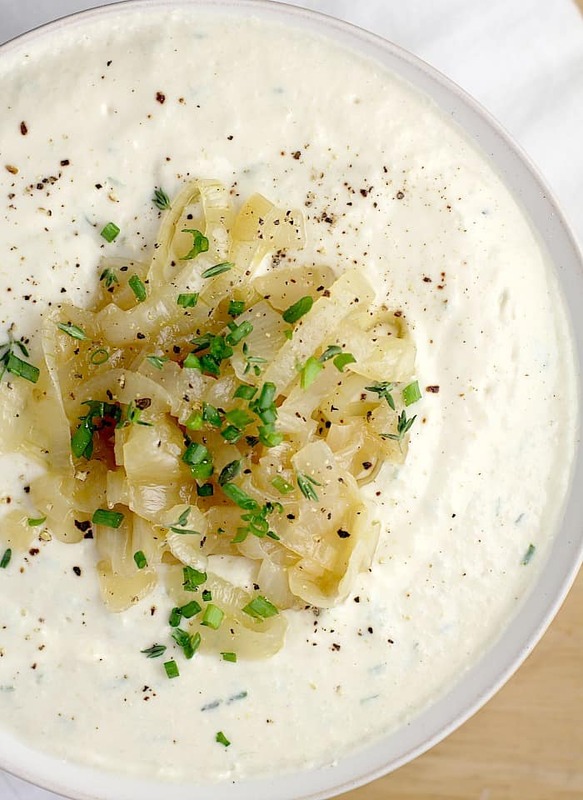 I love a good onion dip! 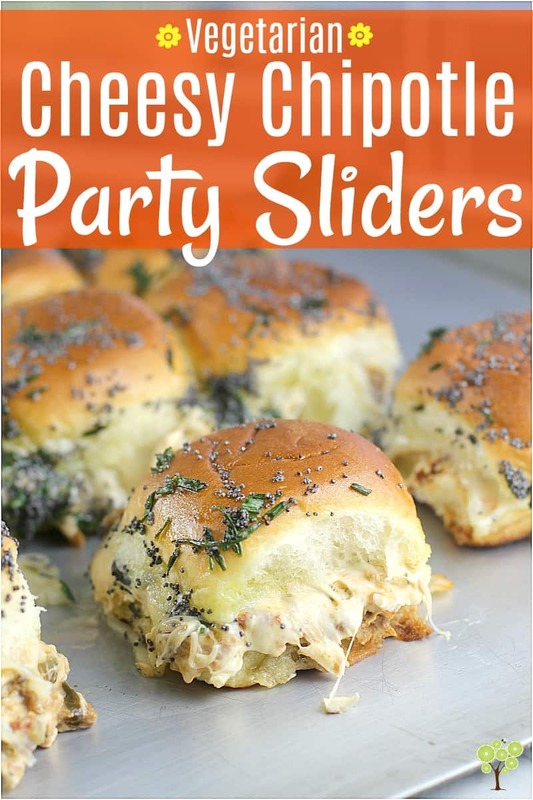 Perfect for holiday parties and get togethers! Half of my family is either vegetarian or vegan, so finding recipes everyone can eat makes me happy. 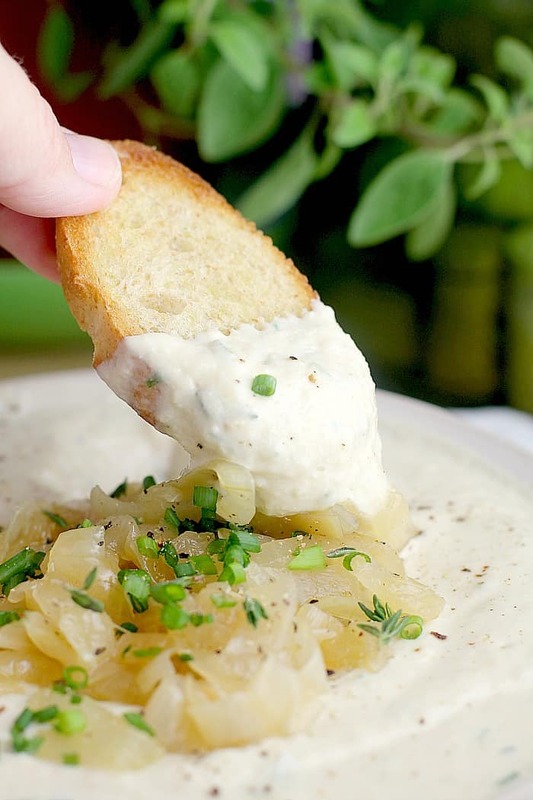 This carmelized onion dip looks too good to be last long in our house! Onion is one of my favorite veggie. I like onion in everything. This dip looks so yummy. I might try to make this for my family. This dip looks and sounds great. ’tis the season to entertain! This looks so delicious! I would love to take this to my mom’s Christmas Eve for our potluck. 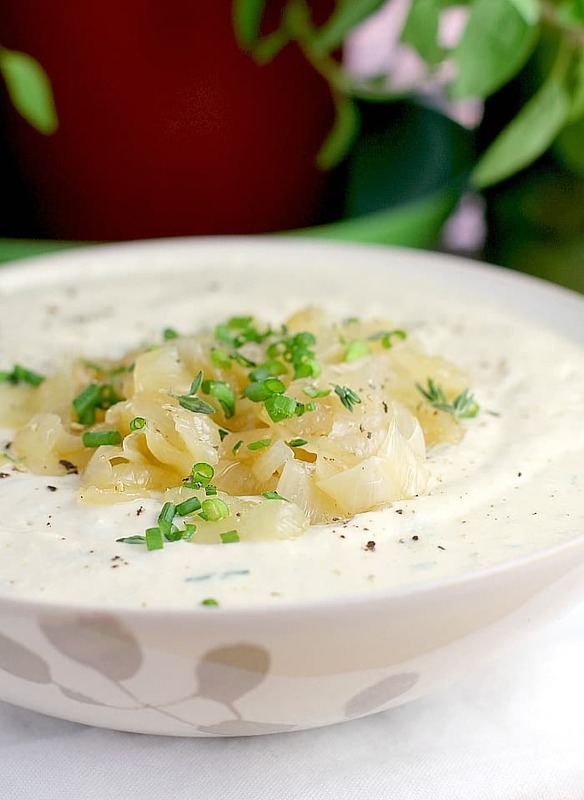 This onion dip looks so creamy and delicious. It is hard to believe that it is so easy to make but it’s perfect for the holidays. 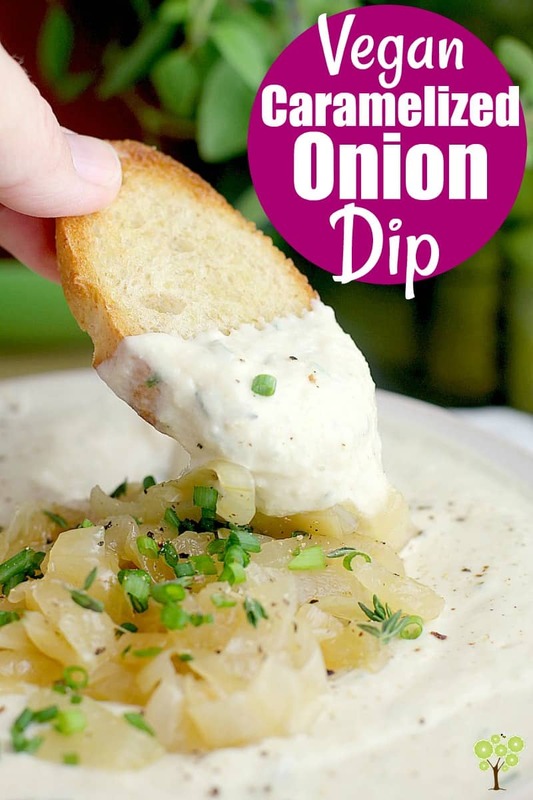 onion dip? hmm i bet my onion loving husband will definitely love this its just that it has wine and hes not a drinker lol he might be questioned about its taste. Looked very tasty!